Are you someone who loves connecting with people while working in your business? Are you craving less time at your computer and more time being with people? worth on a more consistent basis? Lately everyone seems to be hype-ing “online marketing” and reaching people via computer. Well, recently I’ve started noticing a new countertrend, which is GOING LOCAL. Because the reality is, most business owners I talk to love being a part of real-life community where you get to interact and enjoy being with other people in person. Since the beginning of time, business owners have created thriving businesses in their local community. Where you get to know people and have relationships with people you see regularly. Isn’t it great when you go to a local cafe, and they know what your favorite order is? You get that instant feeling of belonging, and your day is brightened up by connecting with other people. Virtually all the successful business owners I know became successful by learning how to get clients LOCALLY. In fact, I’m going to be hosting my first local event in years, because I want to connect with more people in my local area. I remember hosting a workshop event 5 years ago with 30 people… not only was it a total blast, it also led to $30K of local clients for my business. Not bad! The first step to getting a new client is forming a CONNECTION. As you’ve may have heard, people need to get to know you… like you… and trust you… before they are ready to buy from you. And it’s just a lot easier to form connections with people in person. You go from being a complete stranger to someone that they view as an expert. People get a substantial taste of what you do, and many people you encounter will want even more of what you have to offer! It’s easier to gain a potential client – and have long-term clients – when you’re connecting with them in person. By using local marketing strategies, I was able to create a 6-figure business nearly 7 years ago (which was the foundation for the $1 million a year business I operate today). Now, in a brand new training program, I want to show you my most successful methods for attracting clients in your local area … so that you confidently offer your services, make more money in your business, and have a business that fosters community and brings people together. This program is specifically designed for coaches, consultants, holistic practitioners, therapists, and other business owners who provide services to their local community. Get Clients In Your Backyard is a brand new training program that shows you how to find all the clients you want in your local area – and how to contribute in a big way to your local community. In this in-depth 4-week telecourse, I will give you the EXACT same system I used to create a 6-figure PLUS coaching business with awesome clients located primarily in my local area. My intention is that when you follow my step-by-step training, you’ll easily earn back 10 times your investment in this training (all you have to do is enroll 1 or 2 new clients). 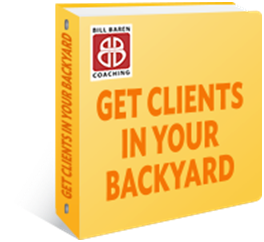 Get Clients In Your Backyard is 6-week teleclass that I guide you through, week-by-week, as soon as you enroll. I’ll personally walk you through the Get Clients In Your Backyard system via pre-recorded training teleseminars and powerful live Q&A sessions with me. You’ll get instant access to each training call (and a complete transcript) on our member site for you to access any time. In the first training audio of this program, I’m going to give you a 4-step system to follow for getting all the clients you want in your local area. Many of my clients have had income breakthroughs by implementing this simple system in their businesses. One of the things I noticed in teaching business owners is that there can be a gap between receiving information and actual implementation. So I designed this easy-to-follow system to be a plan to guide you. With this 4-step system, you’ll learn how to turn your experience and expertise into a successful, locally-oriented business that generates $10,000 a month. So that you can enjoy a business full of connection, community, and fun, without having to sacrifice a good income. I’ve figured out 8 different methods for attracting high-end local clients that are highly successful. In fact, it only took TWO of these methods for me to build a business in excess of 6-figures. Now I want to show you exactly what I did to create that kind of success. And how you can do it too. I want to give you specific methods you need to attract all of the clients you want in your local area. Information you don’t usually figure out by accident. In fact, some of these methods will be contrary to what you’re hearing in other places (often passed on by people who are struggling themselves). I’ve met plenty of entrepreneurs who try to “wing it” and do local marketing without any real training or guidance. Unfortunately, most of them aren’t getting the results they really want. But once you know the secrets of PROVEN local marketing strategies – it’s the easiest way to dramatically increase the number of clients you’re working with. If you usually come home after a networking gathering feeling it was a waste of time, then this module is going to open your eyes to a different way of doing things. Because there’s a good chance you’ve been doing networking wrong. I want to show you how to do networking in a completely different way, called “Hub Marketing.” When I practice hub marketing instead of networking, I can generate $20K to $50K in new client business at an event – and I’m going to show you how. In this module, you’ll discover how to attract tons of the RIGHT prospects (and marketing partners) while at local events – people who are more likely to buy and refer your services and products. You’ll never waste time at a networking event again, when you learn the secrets of Hub Marketing. You’ve probably noticed that people in your area don’t use the Yellow Pages to find services like yours. Instead, they are doing searches on the Internet, using Google, Yelp, and other websites. In addition, recent research has shown that 40 to 50% of all Google searches are local searches, so a lot of people are searching for resources in their local area. The question is, are people finding your business when they search online, or someone else’s? In this module, I’m going to show you exactly what to do to make it easy for your business to be found by people already looking for you. Let me tell you why I love this strategy. With very little work we’ve been getting 2 paying clients come to us each month. That’s right, they find us on the internet, contact us, and then hire us. The reality is, this strategy alone is worth the entire investment of this program. And this is the first time I’m going to teach this strategy in detail. Making an in-person connection with a room full of interested people is the best way to generate sales and create long-term clients. You’ll learn how to use basic speaking opportunities to get in front of your target market, build your list, and get new clients! You don’t have to be super charismatic or entertaining to make money from speaking to an audience. I’ll lay out a simple formula for you to use. I’ll share with you how I gave a 3-hour workshop for 30 people that resulted in $30K of client income, and how you can do it do. Does the idea of speaking to a group scare you to death? Don’t worry, when you hear me break down the process, you’ll discover that even starting with small groups can be very profitable for your business. If you are like most business owners, you get a lot of your clients through word-of-mouth referrals. Because people trust the recommendation of a friend, family member, colleague, or even complete strangers who leave a review on the internet. In fact, I know business owners whose entire businesses are fed by referrals. But this high number of referrals doesn’t happen by accident. They happen when you are using a referral system in your business. In this module, you’ll learn how to harness the power of referrals to generate a steady flow of new clients. When you follow the basic 5-step referral system I give you, you’ll discover that your clients will enthusiastically start to market your business for you. If you love connecting with people, then you’ll love this marketing strategy. In this module, I’ll show you how to connect with potential clients through “house parties” that lead to $16,000 of income each year. You’ll find out how to spend time with people you like having a great time and get clients in a low pressure, fun environment. And how to consistently get clients at these specially-designed parties. This is one of my favorite modules, because I can virtually guarantee no one else who offers your services is doing this, so this is an easy way to stand out from the crowd. With this marketing strategy, I’ll show you to get 1 new high paying client every time you send out 6-8 letters in mail using my fill-in-the blank letter template. If you’re looking for a simple, inexpensive way to find clients, then consider creating a local “Meetup” group that brings your ideal clients together. Meetup.com is a very popular social networking site that makes it really easy to create a group around a particular interest, attract members who share that interest, and hold events to meet group members offline. In this module, I’ll show you how to create “Meetup” events and communities that allow you to attract a steady stream of your ideal clients. If you love connecting with people, then you’ll love this marketing strategy. You’ll find out to spend time with people you like having a great time and get clients in a low pressure, fun environment. Facebook has more than 500 million active users. Your potential clients are using Facebook on a daily basis… but how do you harness the power of Facebook to attract clients? In this module, I will show you some of the Facebook Marketing secrets we are using at Bill Baren Coaching to attract clients in your local area! During the program you’ll have access to a live Q&A session with me, where you can get your top questions answered as well as powerful coaching to support you in getting into action. Bring any questions you have about attracting local clients and you’ll get answers and coaching directly from me. Equally valuable, you’ll learn a lot from the advice that I provide to your peers during thiscall. I want to give you my most powerful tools and resources – so that you have everything you need to have incredible success with finding and attracting all the clients you want locally. This select set of bonuses is worth as much as (if not more than) the Get Clients In Your Backyard program itself. I’m going to show you my #1 method for getting your business onto the first page of Google local results. Simply put: when you’re on the first page of Google results, this means A LOT more potential clients can find you. I recently saw a statistic that 40-50% of ALL Google searches are for local results. And you may have noticed that Google automatically displays local results for many searches, even if you don’t type in a city or location. So let’s make things easy! I’ll give you the exact method I use to for getting a business onto the first page of Google local search results. When I did this for my own business, I was on the first page of local searches in less than one day. creating a 6-figure income with local clients. You’ll get this as a downloadable PDF. With my local plan in hand, you’ll have a clear picture for creating a more profitable business based on connecting with people in my community.Whether you are new to local marketing, or you’re a high-profile expert in your community, you are going to love this local marketing plan. Needless to say, this bonus alone is worth your investment in this training!